The Afghan Hounds are beloved for their beautiful, long flowing coat! One of the most ancient breeds, the Afghan Hound is depicted in cave drawings in northern Afghanistan. It is also mentioned in Egyptian papyrusese. This dog breen has been highly prized in Afghanistan. Exports to other countries were severly restricted until the twentieth century, and even today they are rather rare and fairly costly. They became recognized by the AKC and CKC in the 1930s. The Afghan Hounds are loyal and sensitive, with a tendency to be extremely independent. This breed is courageous and noble, and is suspicious but not aggressive toward strangers. It can be trained to be a good watchdog, and it's a good dog for racing. The Afghan is a sighthound breed. Sighthounds are known for their speed and keen eyes. Once used to hunt hares, deer, goats, wolves and gazelles, the Afghan is now a favorite breed for lure coursing. This breed is adaptable to a variety of climates. When choosing an Afghan Hound, look for signs of allergies, as well as heart disease, cancer, and chylothorax in the dog's bloodlines. 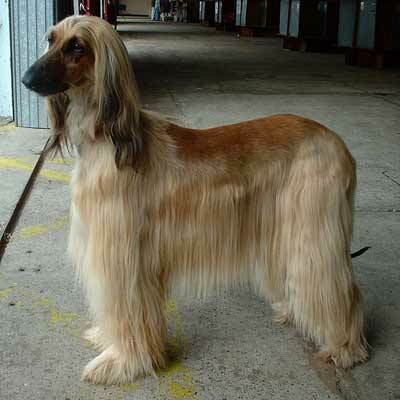 The Afghan Hound is a sighthound breed. Sighthounds are known for their speed and keen eyes. The Afghan Hound is one of the most ancient dog breeds in existence. Its origins are believed to go back several thousand years. It is depicted in cave drawings in northern Afghanistan and mentioned in Egyptian papyruses. It may be closely related to the Russian Tasy breed. In addition to hunting, the Afghan was also once used as a herder and watchdog. The Afghan was prized in Afghanistan, and was rarely found outside the country until the twentieth century due to export restrictions. It became recognized by the AKC and CKC in the 1930s. In 2005, and Afghan puppy became the first successfully cloned dog. Afghan hounds are tall and slender with elongated, narrow heads. Their eyes are dark and almond shaped, and their ears flat on the head. The underside is concave, and the hips prominent. The tail is curled but does not go over the back. The Afghan's coat is long and silky, and comes in a variety of colors. The most common markings consist of a sandy color with a darker face and ear fringe, and white markings are considered unfavorable. Afghans are large dogs. Males are 27 to 29 inches tall and weigh 58 to 64 pounds. Females are slightly smaller. This breed needs a diet high in fiber and carbohydrates. Good food choices include poultry, lamb, brown rice and wheat. The Afghan's gorgeous coat is very labor intensive. Weekly bathing is crucial if the dog is to be shown, and advisable if kept as a pet. This is because brushing the coat when it is dry will damage it, causing it to mat more easily. If you do not have the time to commit to frequent bathing and brushing, you'll need to keep the dog's coat trimmed short. A snood can protect your Afghan's ears from getting soaked with food while eating. The Afghan sheds moderately. If kept inside, frequent vacuuming is advisable. Allergies are also common in the breed, so regular dusting is important. An air purifier may help reduce allergy symptoms for dogs kept indoors. Afghans need plenty of room to exercise. It is inactive when indoors, and is not the best choice for apartment life. It may live outdoors full-time, but usually prefers to sleep indoors. Sturdy food and water bowls are important, because the Afghan may chew them if bored or nervous. It's also a good idea to provide a soft bed, because this breed's protruding bones could cause sores if it sleeps on a hard surface. Afghan Hounds get along well with humans, including children, but they are sensitive to stress. They may, however, be too rambunctious as puppies for young children, and even as adults they might chase them. They are not to be trusted with small pets, including cats and dogs of small size. This is a very stubborn breed, and its independence can make obedience training and housebreaking quite difficult. Proper handling and socialization from a young age is essential in order to keep them from being too timid or jumpy. Daily walks are very important for Afghans. They also need ample time to run free in a fenced area each day. Afghans have few genetic problems. Things to avoid in a potential mate for your dog include cancer, heart problems, and chylothorax in their lineage. Average litter size is eight puppies. Overall, the Afghan is a healthy breed. They do tend to be sensitive to anesthesia, primarily because of their low body fat. Other common problems are allergies, cancer, and urological problems. Chylothorax, although rare, is more common in this breed than most. This is a condition in which the thorassic ducts leak, allowing fluid to ender the lungs and possibly causing them to twist inside the chest cavity. This condition requires surgery and can be deadly. Afghan puppies are somewhat rare, but breeders may be located online. Prices usually range from $800 to $1,200, although some sell for over $2,000.